ZTechnik® wants to enhance every mile you spend on your R1200GS/GSA by making your equipment work easier with enhanced functionality. Our Windscreen Stabilizer Kit reduces the vibration on OEM screens and all aftermarket screens. It's especially useful on larger touring screens for increased stiffness and stability. 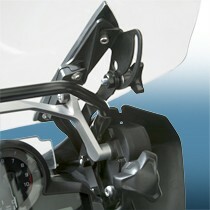 Z5220 Windscreen Stabilizer Kit installed on 2013-Later BMW® R1200GS/GS Adventure motorcycle. To adjust the windscreen, first loosen the two Three-Lobed Knobs on the Swing Brackets attached to the windscreen. Use the OEM windscreen adjustment knob to raise or lower the windscreen to the desired height. Retighten the two Three-Lobed Knobs on the Swing Brackets and ride away... without windscreen vibration! 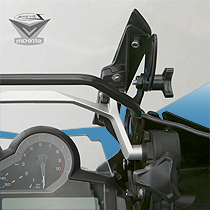 ZTechnik's Z5220 Windscreen Stabilizer Kit adds support and strength to the OEM windscreen mount arms on on 2013 and later BMW® R1200GS/Adventure motorcycles. The Stabilizer Kit securely supports even the tallest ZTechnik Touring Size Windscreen (Z2388; 22.00" Height). The Z5220 Kit also works with all OEM and aftermarket windscreens currently available. 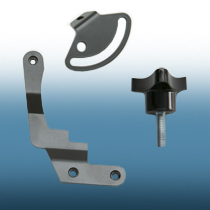 The Stabilizer bracket installs easily and is fully compatible with the OEM windscreen height adjust hardware.